I have another pattern update, and this one is especially for those of you living in warmer climates. 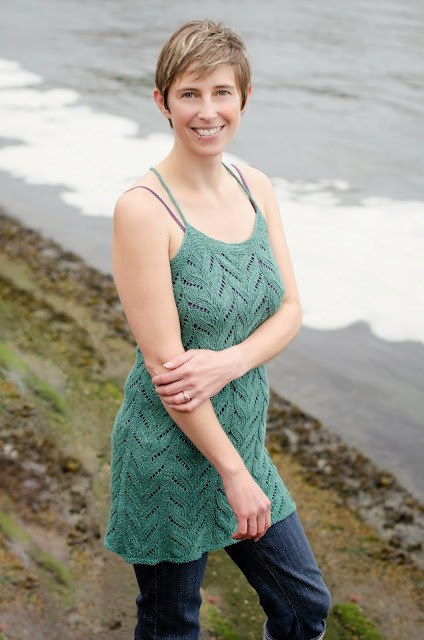 Agave Tank was the first pattern I ever designed, and I'm happy to introduce new photos as well as an added shorter version. This tank was inspired by the year I moved back to Tucson, Arizona. I spent a lot of my growing-up years in Tucson, and I have to say I really didn’t have much appreciation for the natural beauty of the desert. I was born in Peru and having lived in the jungle until the age of eight, I never got used to the hot weather and having to wear shoes because of cacti and rocks and blazing pavement. But when I returned to live in Tucson for a year as an adult, I was impressed by how striking the plants, the sunsets, and the storms were. I noticed things that I’d ignored as a kid because I had been so busy missing my climbing trees and grass and the lake. What I appreciated the most, though, were the agave plants. They seemed like the perfect metaphor for the person I seek to be and the kind of art I want to create. They have this appearance of delicacy and beauty, but are at the same time, intensely pragmatic. Those elegant thorns are sharp and protective. The slick, fleshy leaves are graceful as well as being the perfect water storage device for an inhospitable climate. They’re lovely and functional. And it isn’t just within the plant - they’re useful to people as well. If you carefully remove a thorn from the tip of an agave leaf without breaking the fibers it’s attached to, you have a read-made needle-and-thread that some indigenous people in the Sonoran Desert used for sewing. The Andrea Rangel Knits logo is a graphic of an agave plant for this very reason. It reminds me what I love about the craft of knitting - its potential to create objects that are both practical and artistically beautiful. I had spent a lot of time admiring the agaves in our backyard in Tucson when I came across this lace pattern in a Barbara Walker stitch dictionary. It had a vaguely plant-like feel, and I realized that when I turned it upside down, it was very reminiscent of the upward-reaching agave leaves. I decided it would be perfect for a top-down lace tank worked in a plant fiber so I could wear my knitting in the hot weather. 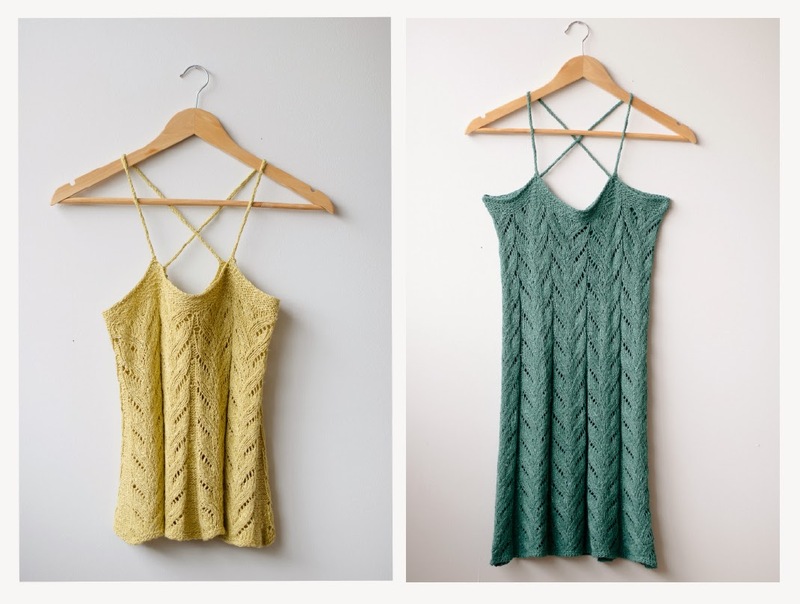 The tank features a row of single crochet at the top to help stabilize the edge, especially since plant fibers aren't very elastic. The I-cord straps cross at the back for a beautiful, distinct look that would work well over a camisole or racerback tank. I’ve always loved this design, and have wanted for a long time to update it so that I would be happier with the photos. I also wanted to include a shorter version, since I know tunic-length doesn’t work for everybody. The updated pattern includes both the short, wide-hemmed version, and the original tunic-length version. The layout has also been updated to match my current style sheet, and I took some time to re-write some of the pattern language. Reading the original pattern made me realize that I have (happily!) grown as a designer over the years, and I think the new way is clearer and more consistent. You can get the pattern on my website, on Ravelry, on Craftsy, and on Patternfish. These samples, along with many others will be on display in my booth at TNNA too. Thanks are due to my photographer, Kathy Cadigan, and model Jessie Kwak. She's modeling the longer version, and that's me in the shorter one. One quick note: This coming Friday, January 3, I'll be having my annual birthday sale. All my independently-published patterns will be 31% off for that day only. You can get the discount by shopping on Ravelry and entering the code "birthday" at checkout. Pattern is designed to be worn with 1-2 in/2.5-5 cm of negative ease at the bust since the lace is very stretchy.